bits-en-pieces: SM City Olongapo Biggest Accessories Sale June 30- July 15! SM City Olongapo Biggest Accessories Sale June 30- July 15! Typical weekends at home especially my time are always planned for home. It is my time to stock-up and refills everything we need for the coming week. Filling-up things in the kitchen, do the laundry plus do and run some errands the normal stuff my time and energy are being consumed. Last night I feel like going to the mall to buy undergarments and to add some few pairs of white school socks for my mini-me. When we were with the kids and accessories section we found a pack of white socks that we needed. Amidst the chaotic environment inside the department store, I did not look around...not until the sales lady informed me that the pair of socks I going to pay was on sale! When I heard the word sale my mind felt at peace and excited at the same time. Well, you know that feeling when you go shop for sale items... that feeling! We were able to score some hair accessories we like. My mini-me got a new gray hat which she loves so much when she tried it on and the size was perfect for her. One striped- gray color headband plus the original item we needed to buy in the first place; four pairs of white school socks. 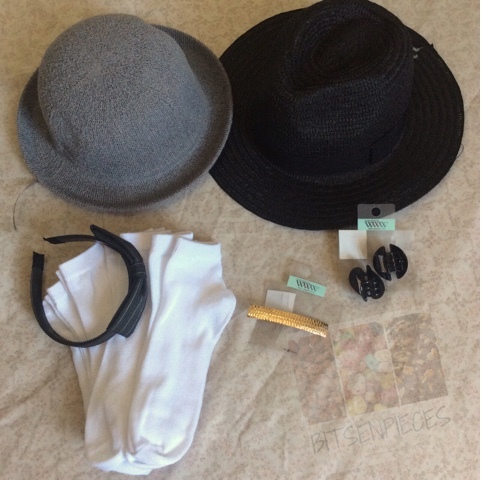 For my haul, I got one black hat plus a couple of hair clips. All these items were at half the price marked down. I paid P428 for an original price of P956. It was a good deal and we love all the items we got! You can still visit SM City Olongapo for the Biggest Accessories Sale until July 15 and grab some pieces you can use for school and office.